THE TOURNAMENT HAS BEEN CANCELLED DUE TO HURRICAN MICHAEL. CHECK BACK WITH US AT A LATER TIME. The 2018 NHSA National Football Championship Tournament (11-man Independent) is open to homeschool, private independent and Christian school teams from around the country that play 11-man tackle football. The Tournament is held in Panama City Beach, Florida with teams arriving on Thursday, November 8th. Games will begin on Friday, Nov 9th and on Sunday, Nov 11th. Saturday is a rest day. Teams will compete for a National Championship. Registration is now open so please click on the “2018 NHSA Team Registration Form” below, fill in the information required and send it in as soon as possible to reserve your spot. Also, you will want the following information. The Laguna Beach Christian Resort ((aka LBCR) in Panama City Beach, Florida is the host facilities for the NHSA National Football Tournament (11-man Independent). All room reservations are to be made through the NHSA office (do not contact LBCR for rooms). 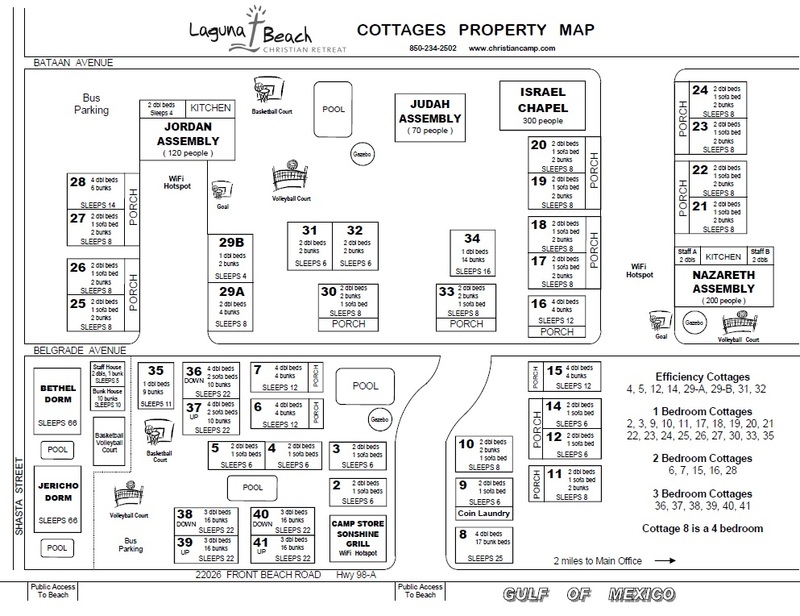 Above is the map of the Main Campus at Laguna Beach Christian Resort. Below: The Cottages of LBCR are located 2 miles west of the Main Campus. Teams and families could be assigned to either places. Teams (Homeschool, private independent and Christian school) interested in competing for a National Football Championship (11-man Independent) should fill out the following form and mail it to the NHSA office (shown on bottom of form). Cost per player, coach, parent, family member and friend is $120 (there is an additional $50 if room is only for one or two persons). This includes lodging for four nights (Thursday, Friday, Saturday and Sunday night), three meals (hot breakfast Friday, Saturday and Sunday) and Awards Ceremony Sunday at 6:00 pm (CST) There are no admission charges to games. Teams have access to a fully-equipped kitchen with dining room where they can prepare lunches, dinners and snacks. Dining room can be used for meetings. Ice machines are available in the dining rooms and teams can load up coolers with ice prior to leaving for the football field. Lodging for the 2018 NHSA Tournament (11-man Independent) will be at the Laguna Beach Christian Resort in Panama City Beach, Florida. All arrangements for rooms will be handled through the NHSA office (770-714-5775). Do not contact Laguna Beach to make reservations. Each person/family will be assigned rooms and can pick up their key at the Laguna Beach front desk when they arrive. Teams will be housed together in dorms that have beds and bathrooms with showers. Families will be housed close to the team. Most suites have at least one double bed plus several bunk beds, at least one bathroom, plus a living room area (with TV), small kitchen (fully equipped) with table & chairs. There are several different size suites and they can house anywhere from 2 to 12 people in a suite. There are several grocery stores, including WalMart and Target, as well as almost every type of fast food and table service restaurant all within minutes of LBCR. What to do? The LBCR campus has several swimming pools, volleyball and basketball courts in addition to the beach. Panama City Beach is a well-known resort that has all types of activities. There is a large outdoor mall within a few minutes of Laguna Beach. 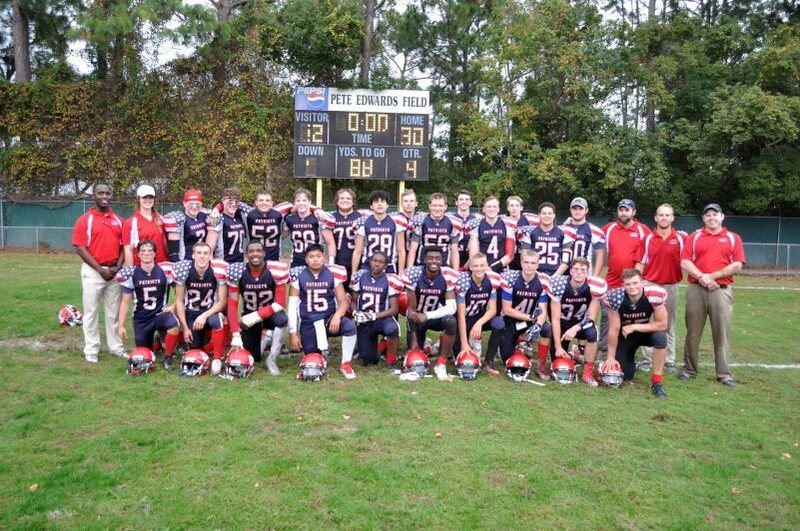 Football fields include Pete Edwards Stadium located at 7300 McElvey Road, Panama City Beach (about 15 minutes from LBCR) and Frank Brown Park located at 16200 Panama City Beach Parkway, PCB. There are bathrooms, but no showers. © 2019 NHSA Tournaments. All Rights Reserved.